The owners of St. Patrick’s Cathedral in New York City are positioning themselves to sell air rights associated with the landmark to permit construction of a high-rise building in the Midtown East rezoning district, where JPMorgan Chase is planning a 70-story tower to replace its current headquarters, the former Union Carbide building at 270 Park Avenue. Representatives of the Roman Catholic Archdiocese of New York are scheduled to present a “restoration and maintenance plan” to New York’s Landmarks Preservation Commission (LPC) on March 13 to show how proceeds from the sale of air rights would be used to improve spaces in and around the church property at 625 Fifth Avenue, which has been designated a city landmark. According to an agenda item listing the meeting, the commission will review a program “for the continuing maintenance of the complex in connection with future development right transfers” pursuant to applicable provisions of the Midtown East zoning resolution. A second midtown landmark, Grand Central Terminal, also may be transferring air rights for the JPMorgan Chase project, according to Crain’s New York. Two investment firms and a developer control a majority stake in up to 1.35 million square feet of transferrable air rights above the terminal, according to the publication, but the preservation commission has not scheduled any public meetings to review any transfers from there. The meeting involving St. Patrick’s is scheduled to take place less than a month after JPMorgan Chase and New York Mayor Bill de Blasio announced that the bank is planning to tear down its 52-story headquarters and build a much larger replacement. A representative for the Archdiocese declined to provide specifics about the air rights plan, but others with the city say it would, if approved, enable the transfer of development rights to the Park Avenue site controlled by JPMorgan Chase. The JPMorgan Chase project is the first major building to be announced for the East Midtown district since the city adopted new guidelines that address where owners of city landmarks can transfer development rights to construct larger buildings. Under previous guidelines, the development rights had to be transferred to sites close to the landmark that has them. Under the new guidelines, enacted in August 2017, the air rights can be transferred anywhere within the larger Midtown East rezoning district, giving owners of landmark properties more options for transferring air rights. The transfer is expected largely to benefit the cathedral, which underwent a $177 million restoration from 2013 to 2016, with Murphy Burnham & Buttrick as the architect. Besides the Gothic Revival cathedral designed by James Renwick Jr. and completed in 1880, the property includes the cardinal’s residence and a rectory designed by Renwick, a French Gothic style Lady Chapel designed by Charles Matthews and built in 1906, and the church grounds. According to preservationists, the cathedral property cannot be demolished without city approval, but it has transferrable air rights that could be used to build an estimated 1.1 million square feet of development elsewhere. The Archdiocese has made no secret about its desire to take advantage of the sale of air rights to benefit its property. The rezoning plan requires sellers of air rights to pay a share of the proceeds to the city to help improve sidewalks, plazas and streets. According to The New York Times, JPMorganChase is expected to buy up to one million square feet of air rights from other property owners, and its air rights purchase is expected to generate more than $40 million for public improvements. 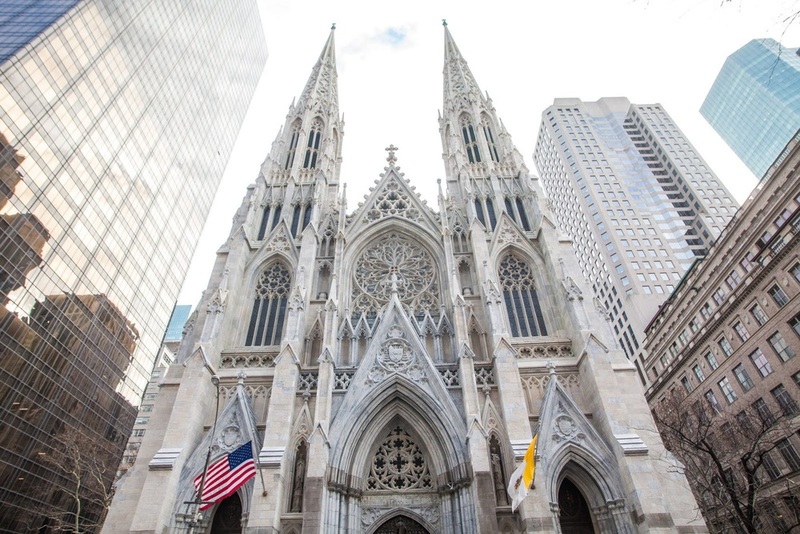 A 2017 analysis by The Real Deal indicated that the archdiocese and St. Patrick’s would receive $270.6 million if it sold all of its air rights, and the city would receive $67.6 million. Under the city’s Midtown East rezoning rules, development and approval of a continuing maintenance agreement is required before development rights can be transferred. The plan can involve both interiors and exteriors of the designated landmark. Although extensive restoration work has been completed at St. Patrick’s, the archdiocese still wants to upgrade building systems, including fire protection and roof drainage., and that is what the conservation plan is expected to address. The JP Morgan Chase project is controversial because it calls for the demolition of an office tower designed by Skidmore Owings and Merrill and opened in 1961. The tower was designed by Gordon Bunshaft and Natalie Griffin De Blois, one of the few women to design a midcentury office tower, but is not protected by landmark status. It would be the tallest building in the world demolished voluntarily. This month’s announcement of the JPMorgan Chase project drew criticism from architecture experts who say the SOM tower should be preserved. The scope of the March 13 Landmarks Preservation Commission does not specifically address the demolition proposal or the irony that a conservation plan that would help preserve the cathedral could be used to demolish the SOM tower. Preservationists have advocated that the preservation commission consider giving the Union Carbide building landmark designation, but no public meetings have been scheduled at this point to discuss such a designation.